Ferris Bueller's Day Off... the sequel !? Yes, it's being shopped around Hollywood right now. In it Ferris has turned his carefree "Life Moves Pretty Fast" motto into a motivational self-help career -- think Tony Robbins, only with a beret and sweater vest. His best friend Cameron is still at his side, managing his massive business. But despite his phenomenal success, Ferris is a bit distracted on his 40th birthday (which, considering his massive fame, is being watched on pay-per-view TV by millions of devoted fans). He decides to take the day off, sending Cameron, his business associates and family into a frenzy. Oh god, this is tragic. Hot on the heels of the shocking announcement yesterday that their show this Sunday at London's O2 Arena would be their last, Martin Scorsese's documentary about the Rolling Stones is finished. It's called "Shine A Light". And look, here's the trailer! I really hate round-up lists, but this is pretty funny. They've corralled some of the worst celeb attempts at foreign accents ever on film. The laptop of a private consultant for the Financial Information Services Agency was stolen from a Korean restaurant at 31st and B'way last night. The stolen computer is believed to contain the personal financial information of as many as 280,000 retired city employees and the obvious concern is that the information could fall into the hands of identity thieves. The Daily News reports that the data could possibly include the names, address, social security numbers, and pension information of thousands of retirees. 1010WINS reports that City Comptroller William Thompson, who oversees the pension funds of city employees, was "outraged," (ya think?). Kim KardASShian is on the cover of the new King magazine. She's the first girl to ever grace the cover who isn't black. But she's got mad back, yo. I guess she's found a loophole. Score 1 for the JFK Customs Officials!!!! Customs officers at JFK have destroyed a shipment of chrysanthemums infected with a dangerous pathogen. The flowers were shipped from the Netherlands and contained 300 stems affected by Chrysanthemum White Rust. The pathogen is not currently established in the United States and therefore is extremely difficult to eradicate and could have endangered plants nationwide had it passed through. Agriculture specialists at JFK have caught at least 8 shipments from the Netherlands since May. They check about 30 flower shipments every day. "She has an air of entitlement about her," city Department of Probation lawyer Matilde Leo said at a hearing in Manhattan Criminal Court. "Probation is a privilege, not a right. ... She has finally abused that privilege to the point of no return." Matilde was talking about none other than Miss Ill Na Na herself, Foxy Brown. Foxy was hauled off to jail yesterday after a judge revoked her probation. Foxy, whose real name is Inga Marchand, was on probation for attacking two manicurists at a nail salon in 2004. She was arrested again August 14 on charges of assaulting Arlene Raymond, 25, on July 30 after the pair got into a fight over Brown blasting her car stereo near her home in Brooklyn. Foxy wound up assaulting Arlene with her BlackBerry. Bulls again had the reins early today, as investors cheered a handout aimed at forestalling any more problems at embattled lender Countrywide Financial. The Dow Jones was up 44 points at 13,280, and the S&P 500 was adding 6 points at 1470. The Nasdaq Composite was higher by 8 points at 2561. Before the opening bell, Bank of America said in has invested $2 billion in Countrywide in order to help the largest mortgage lender in the U.S. weather the current difficulties in the credit market. Countrywide was trading nearly 10% higher in the premarket session. The shares have lost 22% this month. Meanwhile, a key report on loans made through the Federal Reserve's discount window is due out later today. Last Friday, the Fed reacted to a crisis in liquidity by reducing the discount rate, or the interest rate it charges banks that want to borrow, 50 basis points to 5.75%. Ya hurrrd? Have you been following this hysterical prank call story involving Governor Spitzer, his 83-year old dad and $20,000-a-month GOP consultant / prankster Roger Stone? Well, go here and read, jerky. 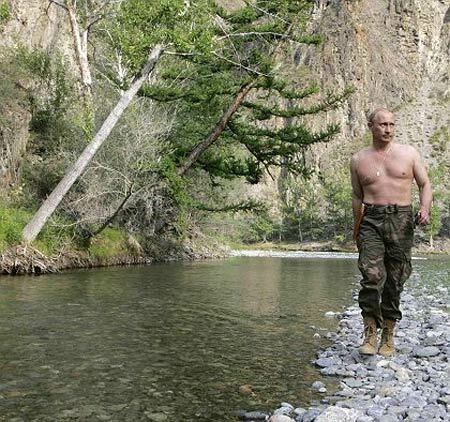 Oh, god help us all... Russia's President Vladimir Putin took his shirt off on a fishing trip and now everyone is flipping out. Meanwhile, a French magazine touched up a photograph of President Nicolas Sarkozy on holiday; cropping his love handles and making his figure more svelte. "A submarine filled with hundreds of millions of dollars worth of cocaine was seized off the Guatemalan coast." Hahahahhaa! Woooooooooooooooooooooooo! Sleepy Hollow Cemetery: Dead and rich ONLY? Leona Helmsley moved into her final residence today: a 1,300 square foot space that featues stained glass windows with skyline views and 12 granite columns. The mausoleum is located in Sleepy Hollow Cemetery in Westchester which is the same place Brooke Astor was laid to rest last week. There'd better be some serious shrubbery at this place! And finally, take a behind-the-scenes tour of Daptone Records' HQ in Bushwick.